Home Dogs How To Stop Your Dog Chewing! How To Stop Your Dog Chewing! You bring your sweet, fluffy four-legged bundle of joy home and excitedly watch them as they start exploring their new home. That excitement soon turns into horror as they start chewing your sofa, chair legs and door frames. Not so adorable now, hey! Even fully grown doggos sometimes resort to chewing to entertain themselves. Don’t despair – there are steps to take to stop your dog chewing your home. Give them a try and see which works for you! The first step to combating chewing is to puppy and dog proof your home as best you can. Hiding electrical wires and getting into the habit of putting shoes and bags in closets will reduce the amount of damage your doggo can cause when you’re not watching! If you want a natural remedy, most doggos can’t stand the smell of clove oil! Dab onto a cotton pad and rub a little oil on the areas they are particularly interested in and it should keep them away! You can buy it from most health shops for only a few dollars. Alternatively, pooches also hate citrus so a squirt of lemon or lime oil onto targeted areas can be enough to keep your doggo away. You can make your own citrus spray by soaking 2 cups of citrus peels in 4 cups of boiled water until cool. If your puppy is teething, she may be tearing up your home in an effort to soothe her sore gums. Try freezing one of her rubber toys to give her something hard to chomp without hurting herself or destroying your house! Exercise is a remedy for all sorts, including destructive behaviours such as chewing. A tired doggo is less likely to wreak havoc on your home. Not to mention exercise results in the release of Endorphins which have a calming effect on your hound. Plenty of daily exercise, particularly before Fido is left alone, should help to reduce chewing. Some adult dogs will become destructive when they are bored. Keeping them stimulated through the day will avoid them finding ways to entertain themselves. Puzzle toys, like these from Nina Ottosson or a frozen Kong stuffed with peanut butter should keep your pooch occupied. 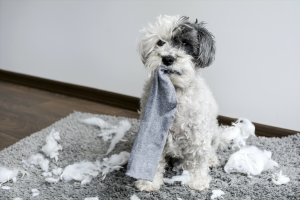 If your dog or puppy continues to chew up the place, there may be a more deep-rooted cause such as separation anxiety – particularly if your doggo is an adult and it cannot be assumed that they are chewing due to teething pains. If nothing seems to calm your dog down, it may be time to check in with your veterinarian and seek advice on treatment options. If you have any other solutions, we’d love to hear them! Please comment below to let us know what works for you and your pooch. Why Does My Dog Tilt Their Head?